When Paul Rodgers started his pro baseball career, there was another sport that was also on his mind, football, he told his hometown Oklahoman newspaper in 1988. That's because Rodgers had a choice before going pro: Signing with the Blue Jays, or going to the University of Oklahoma to play football. "I'm happy now," Rodgers told The Oklahoman in his third pro season that May, playing for single-A Dunedin, "because I'm sure that baseball is my game. I don't think about playing football for OU anymore. Baseball was what I wanted to do, and I feel now that I pretty much made the right decision." Baseball may have been Rodgers' game, but it wasn't one where he would reach the ultimate goal, the majors. He went on to play in a total of seven pro seasons, but he would never make it higher than AA. 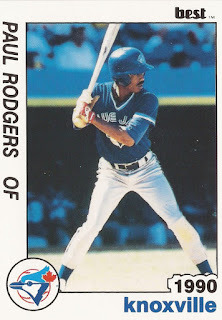 Rodgers' career began in 1985, when he signed that contract with the Blue Jays out of Grant High School in Oklahoma City. Out of Grant High, Rodgers signed on with the Sooners to play football. But then he was drafted. It took him until mid-August to decide, according to The Oklahoman. He signed with the Blue Jays. "It was a real tough decision," Rodgers told The Oklahoman, "but I know this is what I really want to do." Rodgers started with the Blue Jays the next summer, playing at short-season St. Catharines. There, he hit .264, stealing 19 in 73 games. For 1987, he moved to single-A Myrtle Beach, hitting .260 with 11 home runs. He also swiped 28. Rodgers made Dunedin in 1988, returning there for 1989. He hit just .223 his first year, then .269 his second. Rodgers' speed, though, took him to 33 stolen bases in 1988, then a career-high 60 in 1989. For 1990, Rodgers made AA Knoxville. His average dropped again to .228, but he still stole 41. But he only played in one more season. Rodgers started 1991 back at Knoxvillem stealing 11 in 43 games. But he also hit just .193. Moving to the Astros system, Rodgers finished out the year at high-A Osceola, ending his professional career after six seasons.